The Health & Welfare Plan Trustees recently added upgrades to the Plan’s vision care section, please click here to view the member letter. Please be advised that the in lieu of waiving the JRD requirements for retired Construction members, the BCA has agreed to reimburse training costs the same as for active members. Regarding the Quantitative fit tests. Fit tests should be completed for both the North and 3M half and full face masks. The North masks are the 7600 and the 7700. The 3M masks are the 6000 and 6500. A list of training centers is provided for on the Apprenticeship and Training page, please click here. The list will be updated if new providers are found. It is appreciated that members have started submitting their JRD certificates and receipts. It is very important to note that the certificate and the receipt must be clear and legible, also, each item must be scanned or photographed individually. Below are a few examples of how they should be submitted. The following post regarding the Job Ready Dispatch program is in part taken directly from Business Manager Nicholson’s letter to the Lodge 359 Field Construction Membership. Information about how the program will work for our membership and employers has been added to the end of the original letter. 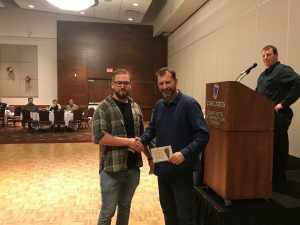 As many members are becoming aware of Job Ready Dispatch requirements across the country, it should be of no surprise that the Owner/Clients in British Columbia are beginning to demand this very concept here at home, and are starting to request that contractors and their crews be prepared to start working the moment they arrive to site. A Lodge 359 committee and the BCA of British Columbia have met a number of times to discuss the importance of maintaining and remaining competitive. Together we have looked at ways to improve our marketability, one of which is the Job Ready Dispatch approach. It has been agreed between Lodge 359 and the BCA of BC to implement the JRD program as described below. A copy of the LoU has also been provided in this mail out for your reference. The JRD program shall be funded by an amendment to the Wage and Benefit Schedule of the Collective Agreement. An Employer only contribution to the JRD program of $0.30 per hour earned as a separate line item will become effective March 4, 2018. So what exactly is Job Ready Dispatch and what are the benefits to the Boilermakers? For members of Lodge 359, Job Ready Dispatch will consist of 4 core certifications. These core certifications will be required by each member in order to be dispatched to work as of September 1, 2018. Each member of Lodge 359 will be required to obtain these 4 core certifications. Upon successful completion, you will send a copy of your certificate along with receipt of payment to the Lodge 359 Training department and you will then be reimbursed 100% of your certificate cost. Adopting a program such as this will not only satisfy the growing requests of the Clients we work for, but will also allow our members to travel more freely to other jurisdictions without being out of pocket for the costs associated with having to obtain these training certificates on their own. The Boilermakers have led the charge in most avenues throughout history and we feel by taking the lead in British Columbia by implementing the Job Ready Dispatch program, we will show the Clients and potential new Clients that we are willing to work with them to create a more viable workforce that is ready to work the moment they arrive to site. What if I already have some of the required certifications? The Union understands that a number of our members may have recently obtained some or all of the required certifications prior to the announcement of the Lodge 359 program, and as such, we have looked at ways to compensate those members in a fair manner. 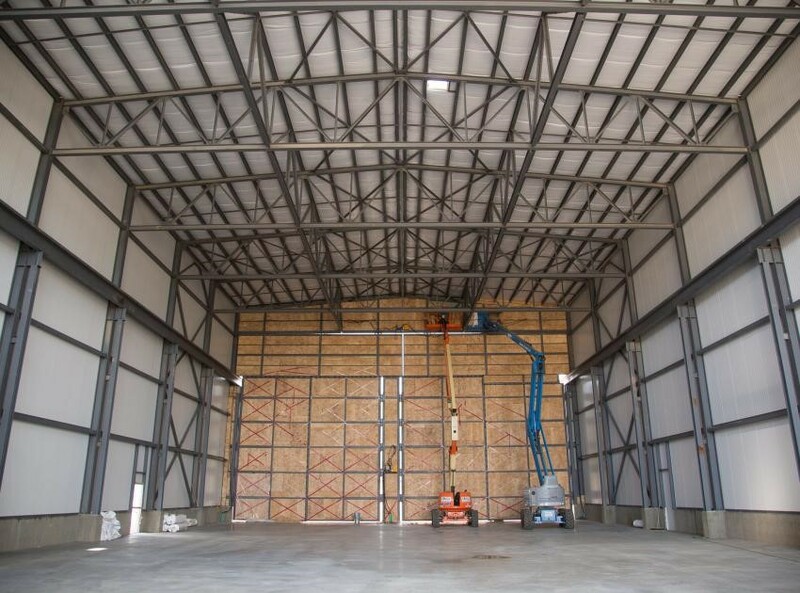 Members who have acquired any of the core certifications listed above that are not yet expired and which have 12 months or more time remaining before expiring will be reimbursed through the ATAC Fund. You must submit a copy of your certificate(s) along with receipt of payment(s) to the Training department and you will be reimbursed on a pro-rated basis. Where can these certifications be obtained? Attached to this letter is a list of the current service providers located within British Columbia, an up to date list will also be maintained on the Unions website on the Apprenticeship and Training page. I have directed Business Representative Jordan Streng and Training Coordinator Gord Weel to immediately begin arranging member meetings throughout the Province in order to discuss the JRD program. Meeting dates will be announced on the nightly dispatch tape and on the Union’s website once they become available. How do I submit my certificates and receipts to the Union? You can bring copies into the office. You can scan copies and email them to jwhite@boilermakers359.org. You can take a photo with a smart phone and email them to jwhite@boilermakers359.org. Copies must be legible or you will be required to resend. How does the Dispatcher know that I have my certificates? Once you submit your certificates and receipt of payment to the Training department, Administrative Assistant Jamie White will enter your documents into the UnionWare data base and the documents will link to the Dispatch module. Next to each members name within the Dispatch module will be a column entitled JRD. Within that column will be a “Yes” or a “No”. Yes means all of your certificates are current, No means that at least one of your certificates has expired or you have never submitted all of the required certificates. If you have a “No” next to your name come September 1, 2018, the Dispatcher will not be able to send you to work. 90 days prior to the expiry of any of your certificates an auto email will be sent by the UnionWare system warning you that a certificate is about to expire. You should take immediate steps at that time to insure that your certificates remain current. How does the Employer access my certificates? Within the UnionWare system is a module known as TransferLink. Our Employers have the ability to request a username and password from the Union to access this secured module. Through this module our Employers can submit Work Orders, Remittances and Certificates. Employers can access and print any dispatch orders related to their company only. Employers can also access and print all safety certificates which are related to their work orders for their company only. For example, if 100 members are dispatched to a job, once that order is filled, the employer will be able to download a zip file containing all of the safety certificates related to those members who are dispatched to the employers job site. These certificates will then be available to WorkSafeBC upon a request of an audit, they can also be shared with the Owner/Clients as proof of training. It is very important to note that Employers cannot access any members personal or private information through TransferLink. Please click here to view the Letter of Understanding between Lodge 359 and the BCA of BC. 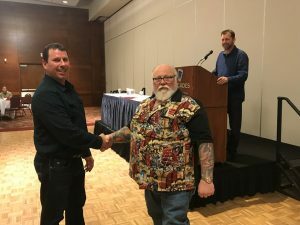 This news article is very important to all construction field members, please take the time to read it and share it with your Union Brothers and Sisters. Our Field Member Health & Welfare Plan is highly subsidized, in essence, those who contribute the greater number of man hours to the Plan help to defer the costs of those who contribute a lesser amount of man hours. Both active, retired and disabled members are entitled to subsidies under certain conditions. Our retired field members receive a higher subsidy than the actives and I think you will agree that they deserve it. When a members hour bank is insufficient to cover the monthly cost of benefits, he or she will receive a self pay notice in the mail. The member is asked two questions on which type of payment to choose in order for benefits to continue. Question one is regarding Subsidized Self-Payment, question two is regarding Unsubsidized Self-Payment. Each month, the Plan’s Administrator, Bilsland Griffith, sends copies of the self pay notices to the Union. One Union Representative who is normally a Trustee to the Plans reviews the signed self pay notices and checks individual member dispatch records in order to see if they worked during the self pay month, or to question whether the member was entitled to a subsidized self payment. If the Representative has reason to believe that the member was working outside of the Trade, that member will be contacted by the Representative and questioned about their employment history outside of the Union. As you can imagine it is very difficult to accurately police subsidized self pays. The Plan has always relied on its members to be truthful and claim their self pay accordingly. In essence, short of requiring each member to supply a copy of their Income Tax Statements and their T4’s to the Plan there is no full proof means to insure 100% compliance. The last thing that the Plans Trustees would ever want to do is eliminate the subsidies, so the next time you sign and date the self pay notice, keep in mind that your decision to choose subsidized or unsubsidized self payments is of paramount importance. There are two reasons why this news article is being posted on the website at this time, one is for the general information of our field members, the other is because one of our members was just confronted about claiming the subsidy when not entitled to it. The member that was confronted will remain unnamed, but it is very important to note that the member said that they were unaware of the rules surrounding subsidized self pays. Just as was described above, this member did receive a self pay notice, either chose to read the terms or not, and then selfishly claimed the subsidy. The member also felt that it was unfair that he/she would now be charged the full unsubsidized rate retroactively for the months that he/she was employed with an employer that was NOT required to make contributions on his/her behalf to the Boilermakers Lodge 359 Health & Welfare Fund. I think that you will agree that this member not only cheated the Plan, but has placed the subsidized system for all members in jeopardy. During the month of June each year, the Health & Welfare Trustees receive a report from the administrator, the report is the annual cost of benefits analysis for the previous year and projections for the current year. Below are a list of facts regarding subsidies from the report for your review. Using an average of 137 hours per month, the 2016 cost per hour is $2.12, including Plan management costs. The Hourly contribution rate is $3.49 (since November 1, 2002). Accordingly, $1.37 per hour is used to offset the cost of the subsidies for Field Pensioners, Self Paying Actives and Disabled members. Based on 137 hours, a Field Member contributed $155.36 per month to the cost of the subsidies in 2016. For the first time since 2010 the Lodge held a Christmas Party for the kids complete with our very own Sandy McKimmie in the role of Santa Clause. There was food, gifts and crafts for all to enjoy. Special thank you to Sat Chatta, Kyle Lepitre and Jordan Streng for setting up and putting together the whole event. 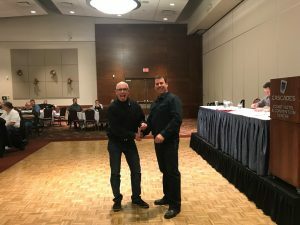 The Christmas membership meeting was once again held at the Cascades Casino Hotel & Convention Centre located in Langley. This years meeting was slightly smaller than most with only about 65 members in attendance. As per past practice service pins were handed out to those members with 25 or more continuous years in the Union. It has come to the Attention of Lodge 359 that employers may have started taxing members’ Initial/Terminal travel fares starting January 2018. It should be noted that this is being done in a manner that is now consistent with the Income Tax Act, and unfortunately there was no information passed along by our employer groups identifying that this would be the practice going into 2018. We encourage all members to keep a detailed mileage record for each job they attend as well as fuel and travel related expense receipts for their personal records. We also encourage all members to ask their income tax providers what costs will be deductible in respect to this new taxation so that all relateable expense receipts can be submitted come tax time. It is our intention during the next round of bargaining to engage in talks with the employer associations and discuss the possibility of changing the language relating to travel expenses to more accurately reflect the current Income Tax Act language. All members are advised to either call the general office or log onto their MemberLink accounts and make sure that they are posted and that dispatch has their current phone number. Although there is no rumour list available yet, by all accounts 2018 looks like a busy year starting with a large outage at the Chevron Refinery in Burnaby. The Health & Welfare/Pension Plan Trustees are looking for one new Trustee in Training. The Trustees would like to thank Jesse Lilburn for his interest but unfortunately Jesse has decided to relinquish the position. The Trustees request that any Field member whom may be interested in the position to call the Boilermakers general office 778.369.3590. Names will be taken up until the 5th of March. The AHC annual general meeting was held at the IBEW 213 Hall on Tuesday January 9th 2018. Part of the agenda was discussing AHC/CHC’s negotiations with the current NDP government that reaffirmed any new projects with BC Hydro will be using the John Hart PLA as a standard agreement over the AHC/CHC agreement. As you may be aware of, the current AHC/CHC agreement will expire with the completion of Revelstoke 6 which is on the table for the near future. BC Hydro also divulged that over the next 10 years they will be spending 10 billion dollars in the power generation sector alone, which would exclude Site C. This money would be allocated mainly for refurbishing and upgrading current hydro facilities. On a good note for the BC Building Trades, the NDP also said that CLAC has had a 16 year run and it was now time for the Building Trades. The first quarterly meeting at the John Hart Hydro Generating Station in Campbell River on January 11, 2018. The updated schedule shows the winding down and completion around summertime 2018 with the current 6 Boilermakers on site to be wrapping up in the next couple months. 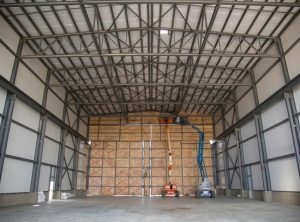 When the Boilermakers put forward the question as to who would be doing the demolition once the project received final commissioning, the answer was they would follow the John Hart Agreement and were in finalizing negotiations with FMI as the contractor. The demolition would be scheduled for approximately a year from now. 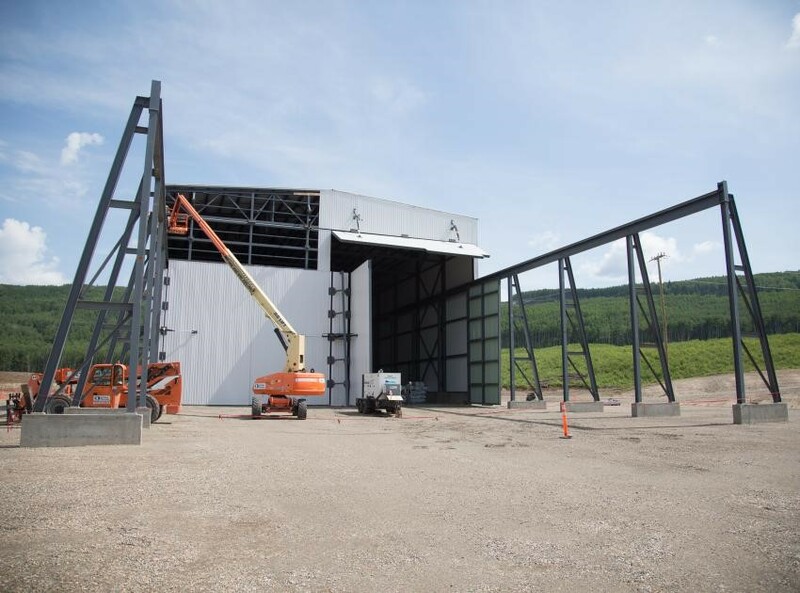 Since the approval of the continuation for the Site C project in mid December 2017 we have seen a return of Boilermakers working on the fabrication of the turbine and generation components. The contractor, Group LAR will most likely be increasing manpower on the day shift to facilitate 10 to 12 members by summer 2018. The table below represents 5 levels of Apprentice training achieved as compared to the total number of work hours for each level and the number of Apprentices which fall into each catagory. A reminder to all Welders, we have an instructor at the training centre two days per week, Mondays and Tuesdays. Our instructor can provide weld performance testing in accordance with CSA B51 and ASME Section IX. Any member wishing to practice or upgrade their skills are welcome to come in any day of the week, but please call first and speak to Gord or Jamie to book a both. As many of you are aware, the presence of unionized craft has been significantly reduced in the northern sector of British Columbia, especially within the natural gas sector. Our members when given the opportunity need to showcase their abilities in order to prove without doubt that Lodge 359 should remain the preferred choice of tradespeople, especially when alternative work forces are constantly looking to fill the maintenance and turnaround needs of Spectra/Enbridge. In June of this year, Lodge 359 members were dispatched to the Taylor, McMahon Process Plant near Fort. St. John B.C. through BCA contractor Altex Field Services. 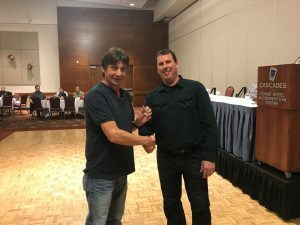 Although the predominant workforce on site was non-union, Lodge 359 members stood out as the most professional workforce, receiving commendation from the contactor, the non-union prime contractor and the plant managers themselves. “The 359 members on the Altex/Spectra Job have done amazing work. The welders continue to perform on a difficult patch job and it has been recognized by the client. The job continues, however, I wanted you to know it’s been a privilege to work with such professional members. “Thank you Wil and all of your team for the outstanding work that was done and the professionalism of the Boilermakers of Local 359. 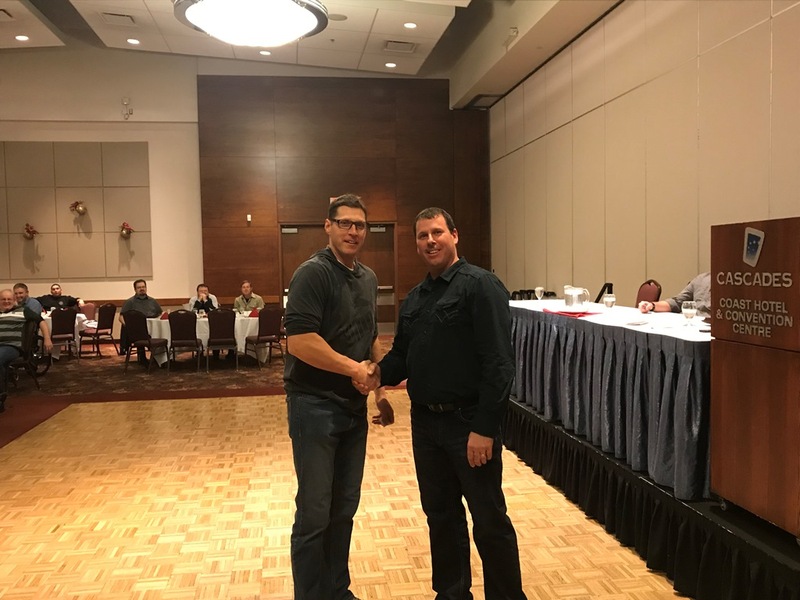 Boilermakers Lodge 359 would like to thank Enbridge and Altex for their kind words, we look forward to a long and mutually beneficial future together. Voith Hydro Canada was awarded the Site C Turbines & Generators contract on April 6, 2017. Voith will design, supply and install six vertical turbines, six generators and associated equipment. Six Boilermakers started work September 11th on the approximate two year on site fabrication of the components. About forty Boilermakers will be on site during the peak of installation. The procurement, fabrication and erection of six penstocks each ten meters in diameter and eighty meters in length have not yet been awarded. The short list of bidders are Aecon-Flatiron-Dragados-EBC JV, Bechtel Canada Co., Peace River Hydro Partners 2, Peter Kiewit Infrastructure Co. The date for final submission of bids to BC Hydro is October 13, 2017. In August of 2017 CIMS Limited Partnership was awarded the construction work on Acid Plant 2. The first Boilermakers were dispatched to start work on August the 28th and there are currently 10 members on site. We expect that more orders will come in this fall as construction progresses. This is certainly historical times in British Columbia. As many of you may have already heard, BC Ironworkers local 97 has entered into an agreement with CLAC. What can only be described as a self serving agreement, the end result is that they will be coming after our work and that of the other trades. This arrangement will end up being a race to the bottom on wages and conditions. I don’t know at this point what the other trades are doing (if anything) about this but I do know we have to protect ourselves from this attack. 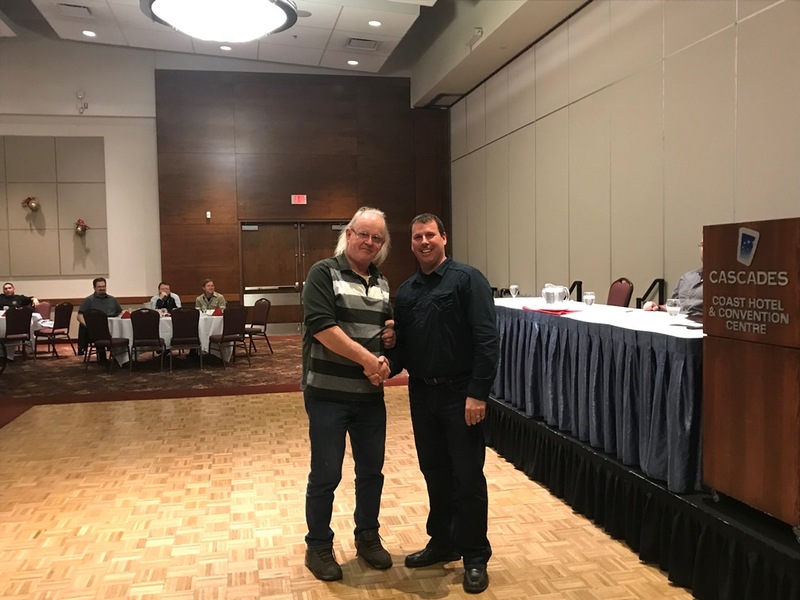 I am suggesting very strongly that we develop a Province wide maintenance agreement to keep our fair contractors competitive and start increasing our market share. Your existing construction agreement will not be able to compete. Once CLAC and the Ironworkers start moving in on us and the other trades it will be difficult to fight them. We have to be proactive and get prepared. This agreement is also going to move into other jurisdictions of the country so I ask that 359 take a leadership role in fighting this. 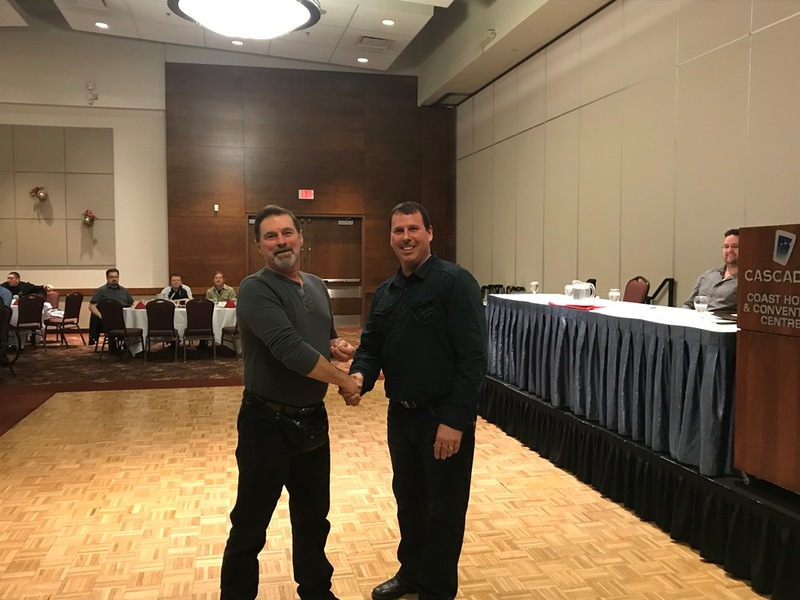 Please be advised that it has recently been brought to my attention that Local 97 of the International Association of Bridge, Structural, Ornamental and Reinforcing Ironworkers (IW) in British Columbia have entered into an agreement with the Christian Labour Association of Canada (CLAC). Immediately upon becoming aware of this troubling situation I contacted the Canadian Director of the Building Trades Bob Blakely and have learned that a conference call has been scheduled with the Canadian Executive Board of the Building Trades, of which I am a member to discuss necessary steps moving forward. 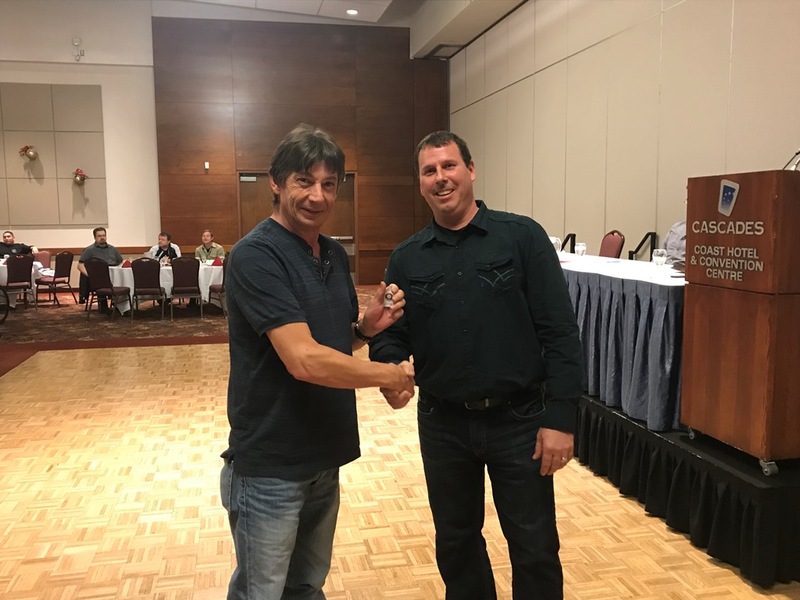 The British Columbia Building Trades held an emergency meeting yesterday, September 6, 2017, and have voted to censure Local 97. I will keep you apprised of any developments in this situation as I become aware of them. It was another beautiful day at Pagoda Ridge for this years golf tournament. Lodge 359 would like to sincerely thank all of the sponsors for their generous donations, the tournament would not be possible without your support. Judging from all the smiles in the photos below it is probably safe to say that everyone had a great time on the golf course and also at the dinner and gift ceremony. Thank you to all that joined us this year and we hope you’re able to participate again in 2018. You may have heard that Christy Clark has proposed new legislation that promises employers they will receive millions of dollars earmarked for injured workers. The way the compensation system works is that employers pay an assessment per $100 of payroll into an “Accident Fund”. In return for this, workers give up the right to sue their employers but are supposed to be guaranteed benefits if they are injured on the job. Employers like this system; it keeps them safe from multi-million dollar lawsuits for negligent operation or dangerous workplaces. After the Liberals came to power in 2001, they immediately attacked the Workers Compensation system. They took away many rights for injured workers and saved the employers hundreds of millions of dollars by reducing injured worker benefits. They even renamed it WorkSafeBC (rather than SafeworkBC) to shift the emphasis for safety to workers and away from employers. No more pensions for life, just to age 65. Benefits changed from 75% of gross to 90% of net! Those most seriously disabled and living on their WCB pensions had the cost of living increase limited to 1% BELOW the cost of living and never more than 4% no matter how high inflation goes. Loss of earnings pensions were made very difficult to get, again for those who are so disabled by injury or occupational disease that they have to live on their WCB pensions, and a loss of income of 25% or less is deemed too insignificant to compensate! Under the Liberals they even made a policy that employers who won their appeals would get interest on their awards but injured workers who had been living in poverty for years while they fought their appeals would get no interest at all when they finally won! Now they have done it again. In blatant pandering to the business community Christy Clark and the Liberals have promised that if re-elected they will give even more to employers. The WCB has created surpluses by denying benefits to workers and reducing the benefits that they do get even if accepted. Now there is no room improving those benefits. The WCB can manage the Accident Fund, including any surplus, in a way that might directly benefit injured workers, i.e. by easing some of the more draconian policies, by paying interest on retroactive entitlements, etc. etc. However, since 2002, the goal has been to ease the burden on employers, a goal well-achieved by the WCB. By forcing the WCB to refund surplus to employers, that power to revise policy to the benefit of injured workers will be limited, and in that regard, clearly the amendment will affect the benefits payable to injured workers. Again. In 1986 the Socred government of Bill Bennett made a one-time payout to the employers of $99 million from the Accident Fund. There was such a huge uproar from the Labour Community and the NDP that the premier had to set up a Commission of Enquiry about the WCB. The result of this commission was a complete restructuring of the WCB so that it was fairer to workers. Now they are proposing not a “one-time” payback, but a payback every year! We should all be screaming bloody murder about this outrageous transfer of wealth from workers to employers as a result of whittling down the compensation system. We all need to remember this: only a change in provincial government will carry with it the possibility of the broad and significant steps required to protect injured workers. Late in 2016 Paper Excellence (Skookumchuck) contacted several building trades Unions regarding their 2017 April/May outage. Paper Excellence Representative Mr. Pat Widmeyer stressed how important it was to them that they try to condense their outage as much as possible. Both Union and non-union employers were invited to bid the major work which is a new economizer for the Recovery Boiler. The Boilermakers agreed to cooperate with the request in order to do what was necessary to insure our work. A revised break schedule similar to what has been tried on other projects was provided. Two half hours breaks, all hours paid will be taken on each workday, please click here to view the Paper Excellence letter. LML was the successful bidder. 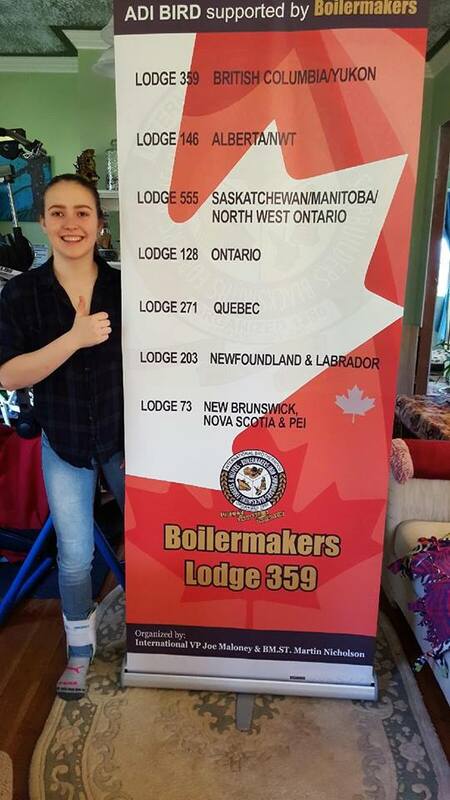 Boilermakers Lodge 359 along with the Canadian International have sponsored local British Colombia BMX Racer Adicus Bird. The Comox Valley newspaper has written a article about this talented young lady, the story can be read by clicking here. Thank you all very much for the donation and the banner!!! As we are all aware there have been times while working on a specific job site for a signatory contractor when it has been discovered that work in which appears to belong to the jurisdiction of the Boilermakers is being performed by another trade. We have all heard of this scenario or witnessed this ourselves and all thought that something needs to be done to address the situation. Contained in Article 6.00 of both the CLRA and BCA Standard Provincial Agreements are the processes in which assignments of work are awarded, as well as how adjudication of disputes regarding improper assignments of work are handled. This process has been utilized many times in the past and has had great success with ensuring our trade boundaries are protected and adhered to. However, there have been instances in which aspects of this Article have not been complied with or simply ignored and the start of a jurisdictional dispute is then created. In British Columbia since 1978 The Jurisdictional Assignment Plan of the British Columbia Construction Industry or JAPlan has been the forum utilized by the trades for adjudication of jurisdictional disputes. Where there is a disagreement between two or more unions relating to a contractor’s assignment of specific work, application can be made to the JAPlan for a determination as to the appropriate work assignment. In brief, the intent of creating the JAPlan was to ensure that there was a mechanism to address disputes over work assignments without strikes and work stoppages on the job site, and to eliminate the unnecessary delays and expenses that can occur from such disputes. Maintenance disputes however are not adjudicated using the JAPlan. For issues that arise regarding jurisdictional disputes in maintenance, the only course of action that can properly address the concern is the grievance procedure outlined in our collective agreements, which unfortunately can take a long time and most certainly the work which was in dispute has most likely been completed. Something we all need to be mindful of when it comes to a dispute regarding our jurisdiction is how we conduct ourselves on the job while waiting for a decision. It can be very easy to become consumed with the thought of simply taking the work back through whatever means possible, or slowing or impeding parts of our other work until we are satisfied that our concerns are being addressed. Unfortunately taking actions such as these creates further barriers and difficulties with our clients who ultimately pay the price. It is imperative that we respect the processes which are in place to ensure that we don’t create an even bigger issue than the jurisdictional dispute and to show our clients that we are worth hiring every step of the way. In other words, we need to continue working as though nothing has happened and let the process take it’s course. Contact the Union to ensure the administration is aware so that if required, an application can be filled out to the JAPlan to request a hearing. Timing is crucial as an Umpire will not hear matters regarding work that has been completed (on occasion certain disputes may be remedied through a phone call). Be patient. It can sometimes feel as though nothing is happening or materializing fast enough. There is a lot going on behind the scenes to have disputes heard and hopefully awarded in our favor. Ensuring Trade boundaries are respected has always been somewhat of a struggle but nonetheless is one of the most important aspects that must be undertaken to ensure future employment opportunities for Boilermakers. Voith Hydro Canada was awarded the $470-millon Site C Turbines & Generators contract on April 6, 2017. Voith will design, supply and install six vertical turbines, six generators, plus associated equipment. About one hundred fifty workers will be on site during the peak of installation, all Trades included. In 2015 Voith Hydro Canada negotiated a labour agreement with the Bargaining Council of British Columbia Building Trades Unions (BCBCBTU). The BCBCBTU represents construction craft unions in BC. A copy of the collective agreement can be viewed or downloaded on the “Membership” page of our website. Business Representatives Jordan Streng and Dave French visited the work site Monday April 3rd as Voith prepared to start constructing a temporary fabrication shop. The shop is to be completed by the end of August. Eight to twelve Boilermakers are expected to be on site as early as September of this year for up to two years of fabrication before the powerhouse installation begins. The procurement, fabrication and erection of six penstocks each 10 meters in diameter and 80 meters in length have not been awarded at this point. Aecon, Bechtel, Kiewit and Peace River Hydro Partners are all on the short list of bidders. A few issues have been identified regarding the new Manulife direct pay system. Please click here to read how these issues have been addressed.